Top Jubilee Coalition leaders are in a fresh plot to raid Cord’s political bedrock and strongholds in move analysts say is to neutralize the growing influence Cord has across the country. Jubilee’s think-tank has been working on a counter-plan to take Cord head on and top on their agenda is to make high-profile visits and rallies to the areas perceived to be Cord’s strongholds. According to those behind this new power game, counties marked as Cord’s strongholds are Kisumu, Siaya, Homa Bay, Migori, Kisii, Nyamira, Mombasa, Kilifi, Kwale, Tana River, Lamu, Kitui, Machakos, Makueni, Kakamega, Busia, Bungoma, Vihiga and Nairobi. Others are Garissa, Kajiado, Mandera, Marsabit, Narok, Taita Taveta, Wajir and West Pokot. Sources say, the plan is to have local leaders organize high profile rallies to be addressed by President Uhuru Kenyatta and his Deputy William Ruto among other top Jubilee politicians. 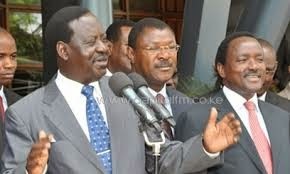 According to the plan, the rallies top agenda will be to counter Cord’s popularity and push for a national referendum. Politically speaking, the regions the Jubilee plans to visit have remained loyal to Cord leaders Raila Odinga, Kalonzo Musyoka and Moses Wetangula. Analysts say it will be a toll order for jubilee to penetrate these regions since more than one year after elections, the regions have remained loyal to the opposition.